One of the most delightful and touching elements of partnering with blog sponsors here, is when I receive an email from an etsy shop (or other type of site) that I've already caught wind of, perhaps long adored, and/or even purchased from over the years. For quite some time now, I've been eyeballing the expertly curated, and superbly photographed, offerings from etsy seller Dalena Vintage, and must say, it's a sincere joy to welcome them as one of Chronically Vintage's newest sponsors this fall. Of her popular shop, founder Leslie Torbett says, "Dalena Vintage was born of an ongoing love affair between one girl and her adoration of vintage clothing. Each piece is hand-selected for it's beauty, purity and quality. We like to think the result is a collection of dreamy vintage in which girls can lose themselves." And it precisely that which I’ve done – and continue to do – every time I've ever visited this lovely etsy shop, which houses a superb selection of mid-century offerings, such as frocks, hats, jackets and coats, shoes, accessories, and even wedding dresses. The pieces that Dalena Vintage offers are right up my style alley - brazenly feminine, timelessly classic, and so incredibly wearable. It's too hard to pick just one or two items from Dalena Vintage that really speak to my personal style - and which I know will appeal to a great many of you as well, my sweet dears - so today I'd like to share ten (and believe me, it was hard to cap my list there) of Dalena's latest offerings that have really jumped out and nabbed my attention. Aren't these pieces exquisite? I love the fact that Dalena offers a wide range of items, yet they all seem to have a common thread of sophistication, beauty, and ageless charm to them that speaks volume to my vintage loving (and wearing soul). Feel like doing so shopping from Dalena's marvelous yourself? Of course you do! :) In that case, I'm pleased as punch to share a special coupon code for Chronically Vintage readers for you today. Use coupon code at VintageLove when you check out and save a substantial 20% off your Dalena Vintage etsy shop order between today and November 25, 2013. 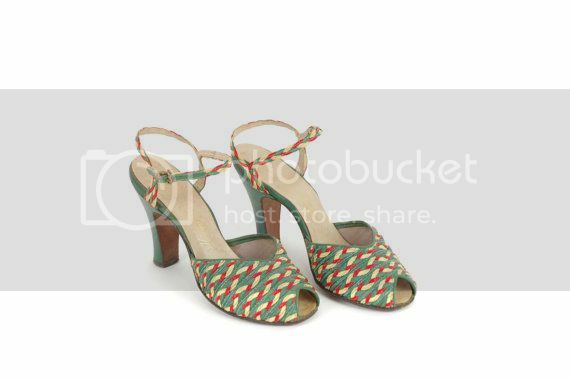 With an inventory that frequently spans the 1900s to the 1960s, there is something amongst Dalena Vintage's beautiful offerings that's bound to appeal to most vintage lovers the world over, and which will, without a doubt, ensure I remain a fan of this etsy shop for a very long time to come. the dresses and the hats are beautiful! All of those pieces that you chose are positively fantabulous!!! I am going over and favoriting Dalena Vintage's shop right now! I especially love those 40's straw shoes, and that yellow 50's number with the velvet bow. Have a lovely Monday dear Jessica. Such beautiful things, I want them all! Following you on Bloglovin too now. How are you doing without your compute? Gosh how can you pick! Such wonderful gems. That 40s hat, love it! want the bandana dress! what a gorgeous design! Lovely shop!! I saw many things that I would love to have in my wardrobe. While I'm leaving a comment I would like to take the opportunity to ask you a question. I'm quite a new reader to your blog and I once read that you wear wigs. Is that something that you do everyday and why? Just got a little bit curious. Thank you so much for a lovely blog with lots of interesting thoughts an photographs! Hello dear Simona, thank you very much for your wonderfully nice comment and question. It's a pleasure to "meet" you! I'm always delighted to chat more about wigs, if you'd like. Please feel free to ask any and all questions on the subject here or by email (chronicallyvintage [at] gmail.com) anytime you'd like. Oh my word! What fantastic pieces. I'm head-over-heels for that polka dot swimsuit. I've been on the lookout for a new swimsuit, and that one is just gorgeous. Absolutely wonderful! I wish I had all these clothes in my closet! Wow, these items are so amazing! I've never heard of this shop, but I'll definitely be checking in on it often now! this store is lovely! 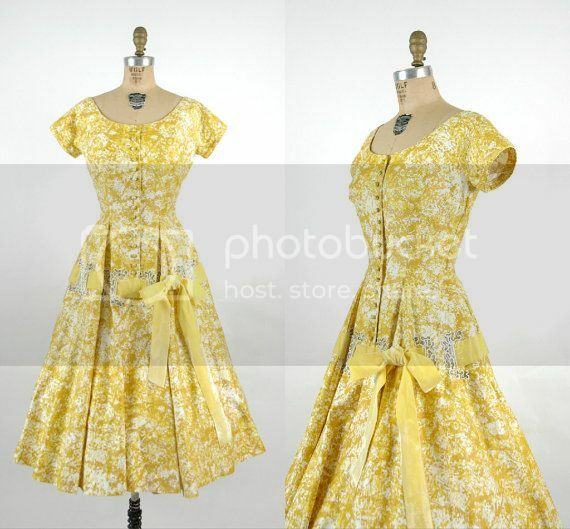 That 1940's dress is beautiful and in my size...oh dear ;) Thank you Jessica for sharing this shop, I will be adding it to my favorites list right now. Oh vintage clothing... you know i am a fan. In fact, I'll share something with you. This weekend I was called to be an extra for a film being made which is from the 70s. I got to wear polyester trousers and top, high platform heels. They did my hair and make up according to the year and it was sooo cool ! About 50 people (all extras) were all in the same room just looking at each other's clothing and look. It was like we had all traveled in time. oh gosh these are to die for dresses! i looooove that yellow lacy one! it´s really a dream! That black 40s peplum is crazy pretty!! These dresses are so darling! And I am drooling over those shoes and the bathing suit/cover-up!! You've chosen some really darling items here! I love that green and white house dress and the two yellow dresses. I wish you a really lovely Wednesday dear Jessica! I'm going to hop on over to her shop after I leave here. Such cute items and wonderful condition. Love how unique they look.